What better way to kick start the 5th Season of the Word N Sound Poetry League than to launch our 1st show of the year with the reigning Queen of the WordnSound mic, Thando ‘The Poet’ Buthelezi. We chat to the Boston Media Graduate about the fine line between hiphop and poetry, her brewing audio tape and why she won’t be defending her title. What impact has slam poetry had on you as a poet? do you think this title carries? Considering that a foundation of Sisters Reigning has already been laid, i’d suppose my responsibility is to keep the culture going by encouraging more and more ladies to come out their shells and actually slam so we can take it again this year. They say there’s a fine line between hiphop and poetry, your writing style borrows from HipHop. Would you say there’s a difference between the genres, if so please substantiate. The main reason I think I’m actually able to borrow elements of hip hop and fuse them with my poetry, is because I guess to some degree I do believe that the two genres are the same, there only difference I’d say is the rate of growth, hip hop is obviously growing a lot faster than spoken word. Unfortunately the more it evolves, there more it drifts from being a sibling of poetry to a distant cousin. But they still family. It is known that you won’t be defending your title at the WNS 2015 Poetry League, Why? The word n sound experience was really great and I’d love to do it all over again but more than that I think I would love to see somebody else being awarded the same opportunity that I was given. Because I believe we’ve all worked equally hard and deserved the title. As a Boston Media House graduate, how does your media qualification benefit your poetry? It has helped me to think strategically, coz before I even put words together I’m already thinking of how I will be able to sell this body of work as a product. Also Doing Radio has helped a lot with improving my Voice, I project a lot better now and all the breathing and MiC techniques I’ve learned, I can now apply when perfoming my poetry as well. You are currently recording your audio tape, what strategy have you put in place to ensure it becomes a success? Well I intend on branching out of the Jo’burg scene for a while, travel around to secure a larger fan base., I’ll be certainly Making use of Broadcast and Social Media Platforms a lot more than i did before because My project is not something i want to limit to the Poetry Scene, it’s for everybody and with that said im challenged also to put together a balanced sound which is accommodating to every person. You comprise 1 part of the Phenomenal 9.
a) What is the phenomenal 9? It’s a divine sisterhood aimed at eliminating competitiveness among us women in the poetry circle and encourages unity and friendship beyond poetry sessions. Because we are a lot more stronger as a unit. b) What is the core function of this group in the evolution of the poetry industry today? Our core function in evolving poetry is to introduce the breaking of boundaries. We have now brought theatre to our ordinary stages, to ordinary people, that’s a culture that we would like to see grow, to see a lot more poets stepping out of their comfort zones. c) Where can 1 find a sample of work the group has produced? We have a Facebook page and all information regarding our work is there, our Women’s day tour was filmed as well as the CLEANSING show we had in December. We hope to avail it to the public soon. My biggest regret as a writer is that for so many years i neglected the fact that i’m writer. I feel like i would have been a lot further than i am now had i took my craft seriously from the onset and invested in it. If you had to improve the WordnSound Poetry league by adding an element of your choice to the platform, what would you add? I would segment the slam into categories maybe, coz I’ve noticed the many different elements that people have brought forward and I would like to see more of that variety being acknowledged and celebrated on the WNS Stage. Which poem have you listened to and thought, snap why didn’t I think of that? Xongani Maluleke’s SIDE CHICK poem. It’s the ONE shem ay! 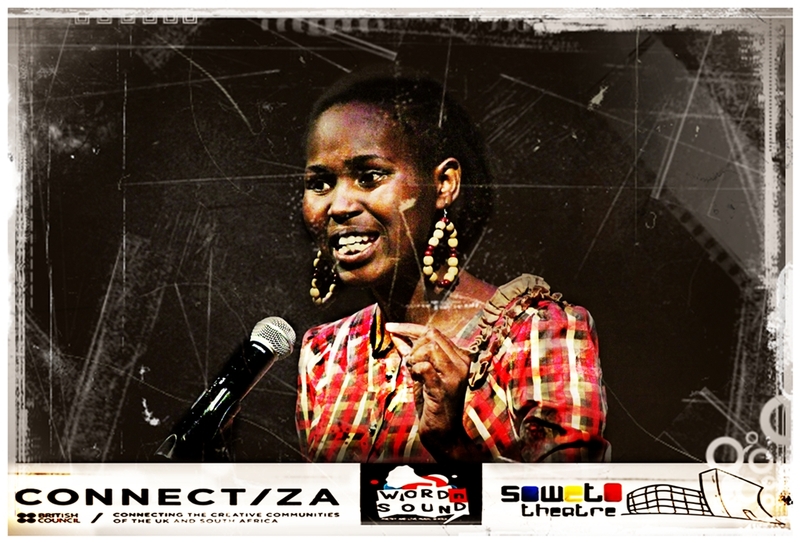 Thando ‘The Poet’ Buthelezi blazed a remarkable trail through Season 4 of the WordNSound Poetry Slam League in 2014. 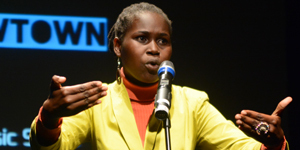 A feat she brilliantly topped off with stellar performances at the Annual WordNSound International Youth Poetry Festival at the Soweto Theatre in October where she was ultimately crowned the Queen of the Mic. She says that the endearing lesson she walked away from her yearlong battle on the WNS Slam stage was of discipline, hard-work and commitment to all aspects of her craft. Heading this lesson paid off, as Thando adamantly made her way through to the end not just for herself but for all those who supported her all the way. What added to her spectacular journey was that Thando strives to write in and incorporates as much isiZulu into her work as possible and says: “Writing in Zulu is actually hard. I had to read, I had to learn, even the accent. I had to work on it because I had gotten used to the English way of writing”. As the reigning Queen of the Mic Thando ‘The Poet’ Buthelezi will showcase her her witty wordplay and ethnically inspired writing as the feature Poet at the Premier Episode to Season 5 of the WordNSound Poetry League. In closing Thando’s advice to those who want to slam in this years’ WNS Poetry League would be to take the Word N Sound stage seriously, and to do this for themselves more than to compete. … is a Johannesburg based EMCEE, Songwriter and poet. … has earned championship titles at slam Competitions and featured on hip hop mixtapes. … has made guest appearances on: YO-TV’s Blue Couch, Mzansi Insider and Soweto TV. … writings has been published in various print media. … participated in the DSTV tour across JHB CBD taxi ranks to raise awareness on women and child abuse. … was selected to be a part of the Phenominal 9 women tour which happens annually on women’s day to celebrate sisters that are doing well within the arts. … co-founded the Sandton Poetry festival which celebrated Poetry movements that existed in and around Johannesburg. Are you ready for SA’s toughest slam? Get excited for your first dose of poetry, as we unveil our newly branded 5th Season of the Word N Sound Poetry League. Kicking things off in Season 5’s first Episode of the Poetry League is the reigning Queen Of The Mic, Her Majesty, Thando Buthelezi – whose ethnically infused style of writing coupled with her witty word play creates a body of work unique only to her. She will be accompanied by 20 of Jozi’s dopest poets all gunning for her spot on the throne. Have you got your eye on the Poetry League Champion title? Make sure you arrive early to sign up for SA’s toughest slam. So join us for what promises to be the hottest poetry premiere of the calendar, as we anticipate more thrills, more spills, more spoils, more props, more poems and more everything. Episode 1 comes as a welcomed reprieve for most poetry lovers who’ve been starved of poetry thus far, so the only question is: are you ready for this year’s Word N Sound Poetry League? Join us at the Market Theatre Lab in Newtown, doors will open at 12pm, the League kicks off at 1pm. The Queen of the mic showcases at 4pm. Tickets will be sold for R50 at the door and space is limited. 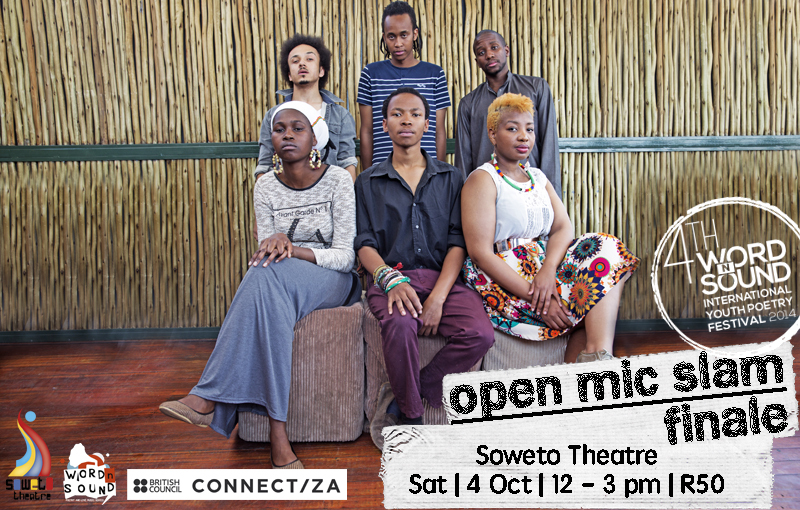 Saturday 4th October saw the 2014 WordNSound Open Mic Finals take place during the at the 4th Annual Word N Sound International Youth Poetry Festival held in partnership with the Soweto Theatre. Remember we told you the finals would be breath-taking? I don’t think any of us were fully prepared for the Word N Sound Open Mic Finals. I don’t think the Soweto Theatre will forget what it bore witness on this momentous occasion. When we say it went down, we mean literally. The stage came alive with props, from oil and powder by a blindfolded Zewande, to condoms and cards by Thando, balls of paper by Nkosinathi, and smoke, courtesy of Xabiso’s incense; we saw flames (by means of a projection on the screen). What did you expect though? This is the WordNSound stage we’re talking about. The first round saw three contestants bowing out, leaving Xabiso, Zewande, and Thando to do battle for the crown. At this point the gloves came off, (and so were the costumes). The competition was tight. The final points tally was close, but in the end there could only be one. They stood on their feet, they pumped their fists and shouted her name, all this before the judges even announced it. After a night of standing ovations, including one during her poem (believe it), the WordNSound Open Mic Crown went to the unsuspecting Thando Buthelezi. That is what Thando said a few weeks before the finals when we had asked her what set her apart from her compition. @WordNSound MY WORD!!! ThandoThePoet always brings it hard.♥♥♥ yoh!!!! … and the audience agreed (well, the ones we spoke to after the show). They loved her. Congratulations to all of the finalists. The performances set a whole new standard. Congratulations to the new Queen of the Mic.